We had Gig Harbor on our adventure "to do" list for quite some time. 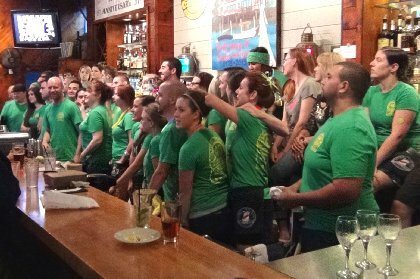 We didn't get serious until we were asked to produce the 40th Anniversary video presentation for the Tides Tavern. We produced the 25th and so we tackled the 40th fifteen years later. I wound up being up late and up early two nights in a row, so I was tired by the time we pulled into Gig Harbor for our adventure. Our B&B was located on the cove of Crescent Creek (above). We didn't get to see them, but we were told that bald eagles use the tall tree on the left as a perch. The tree was about forty feet from our bed. If we had had the time to relax on the deck we probably would have seen some. After we unloaded our bags and put a few things away, Peg and I went shopping for the Gateway News (local paper) and a few other items. About 4:30 we headed to "The Tides." When you get off Highway 16 from Tacoma at the Olympic Drive exit, you turn right and follow the road down to the harbor. At the bottom of the hill is the Tides Tavern. 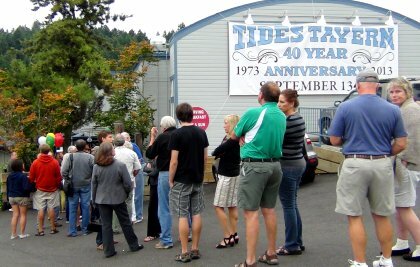 The Tides has been in operation since 1973, but the building itself has existed a hundred years or more. It sits right on the water and has been continually updated and remodeled for the last hundred years in one way or another. We parked and I left Peg in the car for a nap, while I walked around and took some photographs. I walked down to the floating docks and stopped when I heard the lyrics to Honky Tonk Woman by the Rolling Stones, "She was common, flirty, looked about thirty. I shoulda run away, but I was on my own." It sounded like it was being accompanied by a ukelele. 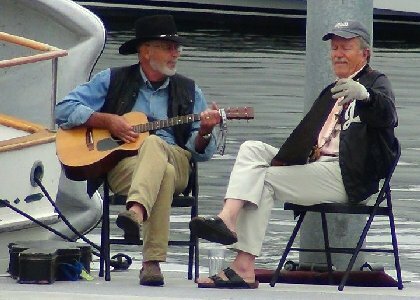 I looked across the water and about a hundred and fifty feet away I saw two people sitting in chairs alongside a boat singing and playing. It wasn't until I got back to my studio that I could see one had a guitar and the other was playing a musical saw. A musical saw? If there had been a kazoo we could have had a hootenanny! I'm pretty sure the guys were members of the band that was going to playing that evening, Daryl and the Diptones. I finished up shooting photos and went back to the car. People were already lining up. Normally, the tavern would have been open, but Friday afternoon it was closed in preparation of the celebration of that night. The doors would open at 5:30. The Tides manager, Kristen Bergeson had warned me to be there early. I talked to a few friends and headed to the front of the line, where Peg and I received lanyards and passes. We went in and claimed a table. 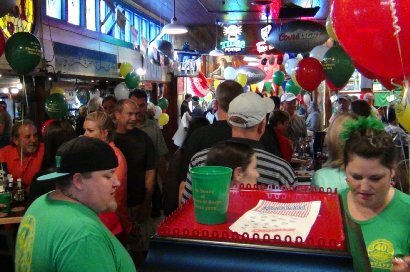 Most of the tavern was SRO (Standing Room Only). Within minutes most of the tables and chairs were taken. I left Peg at the table and bought three slices of excellent pizza, a beer for me and glass of Pino Grigio for Peg. I wandered around and saw my buddy Ron Lunceford (Daryl) doing "mic" checks, while the rest of the band tuned up. My friend Rick Stockstad (Diptone keyboardist) was crawling around connecting his Roland. Rick used to be the voice of a number of our video productions. We also wrote several songs together. His wife, Barbie is a back up singer for the group. Their son, Eliott has an excellent voice, too, and is in the Rotary Club of Tacoma #8 with me. I left the band alone when I spied the sign that said, "Dollar Dogs." The meaty Kosher beef hot dogs were excellent and only a buck. I spooned plenty of relish on two of them and returned to Peg with packets of mustard. Owner Peter Stanley opened the program with a speech and thanked all of his help. The crew was fantastic. They handed out popcorn, took orders, and delivered whatever you needed from the menu in record time. I table-hopped and talked with friends. When we were getting ready to leave two other friends came over and slipped into our chairs. In the old days we would have stayed and stayed, but we just don't do that anymore. We enjoyed the food, the drinks, the company and the celebration, but when it's time to go, it's time to go. We returned to the B&B and called it a night. Saturday morning, we excused ourselves from breakfast at the B&B. Our friends Donn and Deb Irwin, and Rob and Vickie Erb were golfing at Horseshoe Lake. They pulled into Gig Harbor to join us for the morning meal. 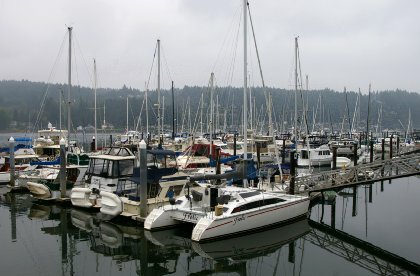 Although, Gig Harbor has grown out from its original center, that center is still the most beautiful part of the town. 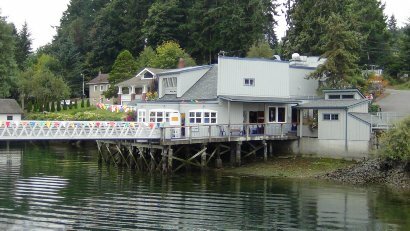 I mentioned when you come down the hill into Gig Harbor, the first thing you see is The Tides, but after that the road winds around the south side of the harbor past marinas, stores, and restaurants. These give way to shops and homes on the west side before revealing all homes on the north side of the harbor. Murals, art, and scenic views are everywhere. 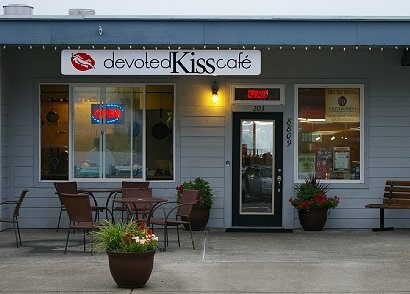 The three couples met at the Devoted Kiss Cafe. We've all eaten there before. The food was good the first time we ate there and it's great now. The menu is limited and primarily focused on egg dishes, but they were excellent. Everyone had a wrap, a quiche, or a version of eggs benedict except for Peg and me. Peg had an excellent granola parfait with lots of fresh fruit. The coffee was wonderful and so was the view. I stepped out onto the balcony and looked down on crows dropping clam or mussel shells trying to break them open for their breakfast. Since the cafe was on the west end of the harbor I looked out to Puget Sound, or could have if the morning fog would have lifted (it never did). I ordered bacon and Belgium waffles. 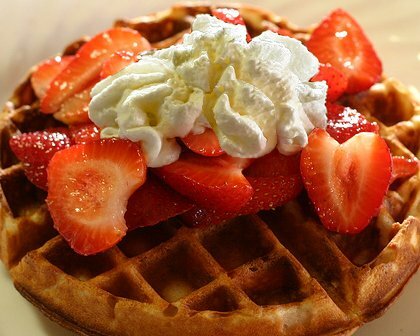 The bacon was perfect and the waffles came with a berry, berry good compote, whipped cream and fresh strawberries. I asked for butter, which melted into the little waffle wells very nicely. The whipped cream was real and the fresh strawberries proved to be enough for me and extras that were added to Peg's parfait. The six of us talked about the University of Washington Huskies and the Washington State Cougar football games which were coming up that afternoon. Okay, actually, the three guys talked about football, while the three women talked about . . . oh, who was listening. They seemed to be enjoying themselves, probably because the men were pre-occupied with their own nonsense. 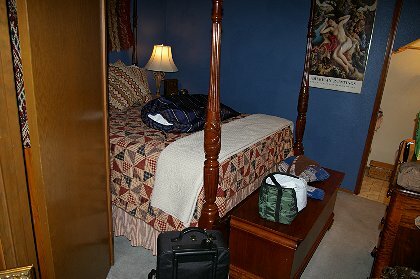 After breakfast I dropped Peg off at the B&B for a nap. I drove around, had some more coffee and read the local paper . . . but mostly I enjoyed the sights of Gig Harbor. Many of the bays, harbors, coves, and lagoons of the Pacific Northwest reveal low tide tidelands of dark brown mud or ooze. To be ooze, it must contain 30% or more skeletal remains of microscopic floating organisms. Although this might sound and look un-inviting to us, this means that birds can find a snack almost any time of the day. 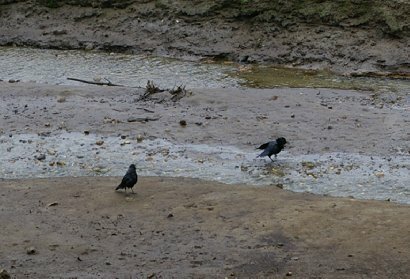 Barefoot people waders or swimmers must contend with mud sucking their heels, while the ooze comes up between their toes. I know, I know, it sounds awful, but if the sun is out, it warms up the mud and the returning tides are heated by the sun drenched muck. Otherwise, the waters of the Puget Sound are fairly cool. Also, low tides allow you to see streams and creeks emptying into the salt water basin. Below the boats and marinas the waters are teeming with life. At the end of Gig Harbor is Donkey Creek, which will have chum salmon re-introduced to it as soon as a new bridge is built to protect the entrance of the creek and give returning salmon better access. Although Donkey Creek ends only a few hundred yards from the harbor that should be enough to allow the salmon to return and re-propagate. I have a friend who did something similar on his own property just twenty minutes away. In Alaska, chum salmon is what sled dogs are fed. I admit it's not as good as King or Chinook, but it's still better than Atlantic salmon . . . and it's wild. Much of the charm of Gig Harbor is certainly contained around the harbor, but man does not live by charm, alone. Back up the hill and across the freeway is Uptown, with it's growing development of shops, restaurants, and one of our favorite theaters. Major release, first-run films are a thing of the past in nearby Tacoma, which means we have to choose between a trip to Puyallup, Lakewood, or Gig Harbor for movie multi-plexes. And since we live in Tacoma's Westend, Gig Harbor is only a few minutes away. 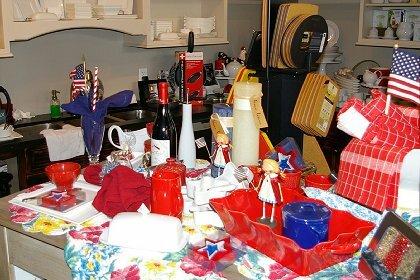 One of our favorite shops is Bella Kitchen and Home for whatever you need in your kitchen or dining room. Peg needed some more bar towels for herself. She had purchased some before for gifts. She likes them because they absorb so much water. 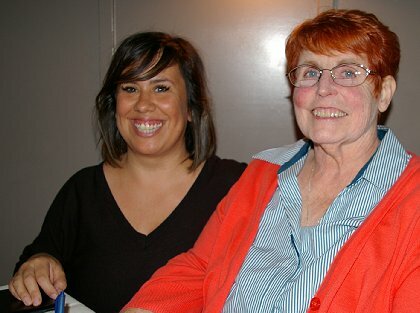 The Bella Kitchen also hosted a book signing presentation for our friend Kelly Cooper, author of Cookies for Grown Ups. For dinner on Saturday night we chose the Brix 25° Restaurant. 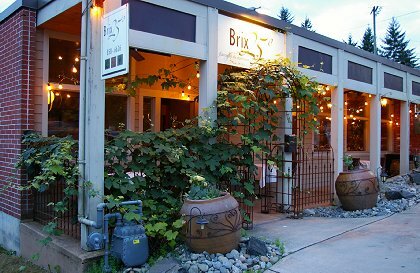 Brix 25° is located a block up the hill from the harbor, but still in Historic Downtown Gig Harbor. We parked about forty feet from the front door. The interior is a little hard to describe. The walls are beige, the heating ducts are beige and bare light bulbs hang inside global contraptions that resemble long, large metal fan blades. It kinda works, but it's not what you would expect from a fine dining establishment. One really nice feature is a collection of rural paintings, which grace the walls in the entrance as well as various eating areas through the restaurant. Prints on canvas are available in various sizes. The print by our table was by Peter Keating. 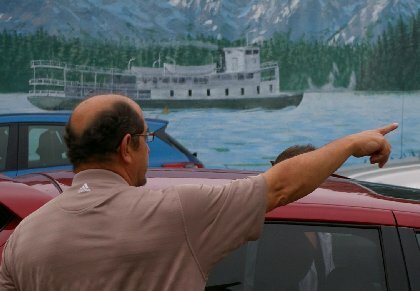 I would prefer original works from northwest artists. I think that would be a really nice touch. An interesting note about the artist Peter Keating, if it is the famous one. The artist is Robert Jeffrey Forbes who was born in 1949 and died in 2007. He signed his paintings "Peter Keating." The Ayn Rand book, The Fountainhead had a character named Peter Keating who was an architect, but always longed to be a painter. Cliffs Notes says, "Keating lacks the strength of character necessary to stand on his own judgment." Nowhere do I find a connection, but my mind wanders . . . and wonders. Brix 25° has flair down really well. Once seated you're served a flute of chilled Wycliff Champagne. Each time our food was delivered or taken away, Gabe did the job properly of replacing dinnerware with quiet skill. Our appetizers were grilled prawns, which came with black olive puree (excellent). A large bowl of steamed clams and mussels came with croutons on top. Once we got down to the broth the croutons were perfect soaked in the broth; however, I would have preferred bread to dip into the broth. The bread came later after our salads and before the main dishes. I enjoyed my "Beef & Bones," which was a filet mignon and beef marrow. Marrow contains vitamins and minerals such as iron, phosphorous and vitamin A, but they are bound up in fat. This is not a bad thing but I would have expected a marrow spoon. 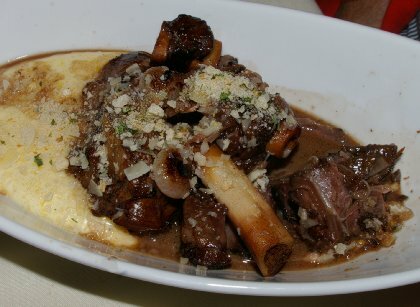 Peg had the lamb shank served over creamy polenta. I traded what turned out to be my one bite of marrow for some pieces of lamb. Peg could have used a marrow spoon also for her lamb bones too. I really enjoyed my filet, my gratin, my baby carrots, and Peg's lamb, gravy, and polenta. In turn she enjoyed my filet and took enough lamb home for lunch the next day. No polenta left the building. I wish more restaurants would serve polenta, which essentially cornmeal mush. It's so Italian. A few months ago Peg made a fantastic fresh tomato, roasted vegetable and sausage marinara sauce. We served it over a creamy polenta with lots of Italian cheese mixed in. Restaurants that serve polenta deserve my business. From the Champagne to the dessert (a huckleberry crumble muffin with vanilla ice cream?) we enjoyed our night at Brix 25°. Our server was Allison, who helped us out with our decisions. Peg enjoyed a pino grigio with the appetizers and salad and then had a syrah with her lamb. 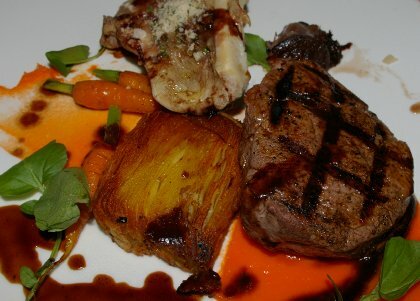 The pino was a little too sweet I thought, but the syrah had just the right body to stand up to the lamb and the filet. My only complaint? I asked for a Shirley Temple (lemon lime soda with cherry juice and maraschino cherries). It was served with only one cherry. The refill had none. Diane, our favorite server at The Lobster Shop in Tacoma would have said, "What? They buy them by the gallon." It's a small thing, I know . . . but life is made up of small things. 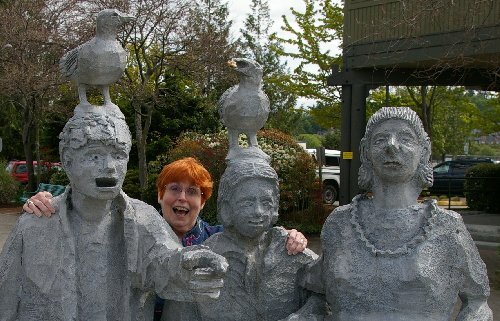 We enjoyed ourselves in Gig Harbor. There were a number of community events going on, so parking downtown kept us from walking around the shops and talking to people, but that leaves us with only one thing to do . . . we'll have to come back and have another adventure. Gig Harbor | Tides Tavern | Brix 25° Restaurant, tides tavern gig harbor, Brix 25° Restaurant gig harbor, devoted kiss cafe gig harbor, donkey creek gig harbor, gig harbor, Tides Tavern Brix 25° Restaurant gig harbor Washington WA.